This spacious home, located on quiet south of the highway cul-de-sac, offers many conveniences and luxuries. 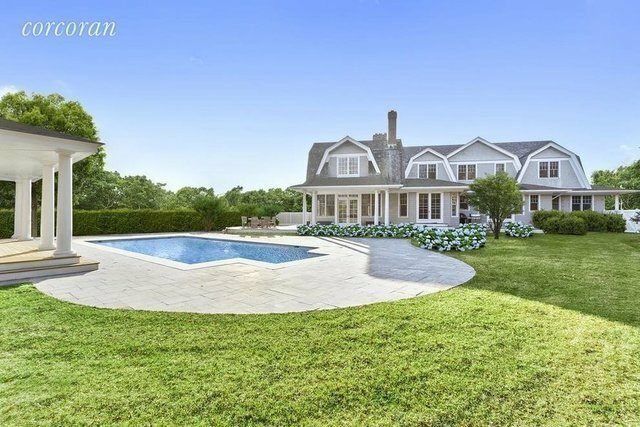 On a shy 2 acres, there is a heated gunite pool, a privately situated hot tub, and a har-tru tennis court. This lovely home has a spacious Living Room with Fireplace, a formal Dining Room with Fireplace, a Great Room with Fireplace and cathedral ceiling, a fully equipped kitchen with a large eat-in/sitting room with fireplace. This house has 5 bedrooms en-suite and a master bedroom en-suite/sitting room with fireplace. There is a two car attached garage and beautiful mature plantings with blooming specimen trees. There are several covered porches on the front sides and rear of the home, great for entertaining. An incredible and fun Hampton's retreat and ready for summer occupancy.